Difference between revisions of "Grand Theft Auto 2"
*This Game can be downloaded & played on the PSP. *All of the respray garages have a "[[Max Paynt]]" sign on the roof. This is clearly a reference to the then-upcoming video game Max Payne, also developed by Rockstar Games. *GTA 2 was the only game in the series that featured articulated trucks, until [[Grand Theft Auto: San Andreas]] in 2004. Grand Theft Auto 2, or GTA 2, is the second major instalment in the Grand Theft Auto series. It was released worldwide on October 22nd 1999, by developer Rockstar North (then known as DMA Design), for the PC and PlayStation. A version for the Dreamcast console was made available, and later a toned-down version for Game Boy Color. The PC version of the game is now available for free download here, along with Grand Theft Auto 1. Although it is not the original game, it has been remade to work on modern Windows operating systems. 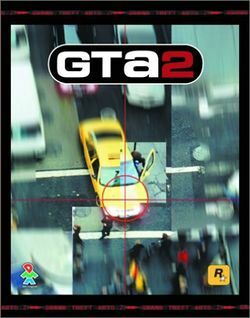 GTA 2 was the first title in the series to adopt early 3D graphics technology present on the PlayStation and some PCs. Whilst the gameplay did not shift to the third person perspective, as did Grand Theft Auto III with its full 3D environment, it utilised 3D graphics hardware/software to improve the visual quality. GTA 2 gameplay was via the top down perspective, as in all GTA 1 titles/expansion packs, but due to the employment of early 3D tech, it exhibited smooth dynamic camera zooming, smooth sprite rotation, and lighting effects from street lamps, car headlamps and emergency vehicle roof lighting. The protagonist's name is Claude Speed. The game takes place in Anywhere City, which is divided into 3 sectors - Commercial, Residential and Industrial. In each of them there are three gangs, whose bosses give the player missions via payphones. Each district also has a maximum wanted level that the player can aquire, likely to make later levels more difficult. The Commercial District allows a maximum wanted level of four, which results in the S.W.A.T. team chasing the player, however, the Residential District bears a wanted level of five, with F.B.I. agents pursuing the protagonist, and in Industrial District you can obtain maximum wanted level of six, so Army will chase Claude. To save the game, the player needs to find the Jesus Saves church. It can only be found by listening out for the organ playing or by hijacking a TV Van (the antenna on top always points towards it). However, once at the church, the player needs to pay $50,000 to save, so it's best not to save until turning off the game. However, completing 2-3 missions will easily reward the player with enough money. Each of the three gangs within the three districts have a gang that they are neutral with, and a gang that they are at war with. The player will earn respect by killing other 'enemy' gang members, but naturally, will lose respect with the gang that they are attacking - a gang with considerably low respect will attack the player if they enter their territory. Respect is also earned by doing missions for each of the gangs, and a high level of respect is required to unlock the harder, but more rewarding, missions. The player can find out which gang is hated by other gangs by going to the blue phone in each of the gang's territory. There are three levels of mission difficulty: easy, taken from green payphones, medium, from yellow payphones, which pay better but require the player to have some respect, and hard, from red payphones, which pay very well, but usually are very hard, and require maximum respect. For completing a mission the player earns money, respect and a money multiplier. Sometimes during a mission the player is also given access to new parts of town, vehicles, or weapons. After completing each level in the PC version, the player unlocks not only the next district, but also one bonus arena. There are two different types, each with 3 arenas; Destroying Ice Cream Vans, and a time-attack mode where the player must race against the clock (killing pedestrians and gang members earns the player more time). Kill Frenzies - killing a lot of people or blowing up many cars in the appointed time. GTA 2 Tokens - collecting tokens with GTA2 signs on them (there are 50 tokens in each level). Wang Cars - finding 8 GT-A1 cars in the Residential District. Zaibatsu Corporation (symbol: yellow 'Z') - They appear in all of the areas and are a seemingly legitimate corporation who manufacture everything from cars and weapons to medication, but beneath the surface they are involved heavily in narcotics, contract-killing and shadowy politics. Their car, the Z-Type, is the second fastest gang car available. The Zaibatsu is apparently led by at least three leaders, or at least have three executives through whom they organize their criminal activities: Trey Welsh in the Commercial District, Red Valdez in the Residential District, and Uno Carb in the Industrial District. Their gang color is black. Their name comes from 'zaibatsu', the Japanese word for conglomerate. Loonies (symbol: winking smiley face) - They appear in the Downtown District. Their gang car, the Dementia, is a microcar with their mark painted on top and is probably named after their apparent insanity. Their small section of turf is in the vicinity of the city's mental institution, named "SunnySide" after the Mental Institution in Montrose, Scotland, near Dundee, where the game was originally created. Their boss is Elmo. Their gang colour is Grove Street green. The Yakuza (symbol: blue yen '¥') - They also appear in the first area. They make drugs at the so-called J-Lab, one of their strongest "industries". Their boss is Johnny Zoo. Deep blue is their gang color, and their car is the Miara. SRS Scientists (symbol: a golden shield) - They are headquartered in the Residential District, and are a clandestine research institute involved in slightly questionable practices. Their business is advanced weapon development along with cloning, genetic engineering and robotics. Their leader, Dr. LaBrat, is Icelandic, and all of their 'street' members appear to be genetically engineered clone soldiers. Their gang car, the Meteor, is the fastest gang car available. Their turf is the Scientist Research Center. Their gang color is pale gold. Rednecks (symbol: the Confederate flag) - Led by Billy Bob Bean, they appear in the second area, are rabid fans of Elvis Presley, and specialize in explosives and vehicles. Their business is the brewing, running and selling of moonshine. Their car is a wide Pickup truck. The Rednecks' turf is the trailer park at the northwest of the Residential Area. Their gang color is light blue. Russian Mafia (symbol: a red star) - They appear in the third area and specialize in contract-killing and gun running. Their car is the Bulwark, a station wagon, which is the most durable gang car in the game (capable of surviving one direct hit from a rocket propelled grenade, hand grenade or Molotov cocktail, if the car is in perfect condition). They can be seen in the seaport areas. Jerkov is the name of their boss. They use red as a gang color. Hare Krishna (symbol: an orange flower) - They appear in the third area and their car, the Karma Bus, is a big love bus with flowers painted on its roof. The Krishna's turf is around their temple. Their boss' name is Sunbeam. They use orange as a gang color. This gang also appeared in the first Grand Theft Auto game (the player would earn the Gouranga bonus for killing them), but they were not involved in criminal acts. Each area features five radio stations, from a pool of eleven, which the player listen to while driving a vehicle. Changing radio stations for preference was also possible in the PC version by using the "F1" function key." "Head Radio" was present in the original Grand Theft Auto, Grand Theft Auto III and Grand Theft Auto: Liberty City Stories. Each gang also has its own radio station that transmits within a limited area. All radio stations only play music, unlike future games, which feature a talk radio station as well as music stations. Head Radio — The city's largest commercial radio station. It can be received in all areas of the game. The DJ's names are Phanny Joe Styles and Johnny Riccaro. Head Radio plays modern pop and rock. Rockstar Radio — A commercial radio station in the Downtown Area. Sammy Starock is the name of the DJ. The station plays pop and rock and occasionally features on-air phone calls from "listeners". KREZ — The Residential Area's commercial station which plays hip hop and rap. The DJ is Richie T.
Lo-Fi FM — A commercial station in the Industrial Area that plays oldies and pop. The DJ (DJ Die/Dye — Dai is a Welsh abbreviation for the name 'David') is Welsh and seems to have no ties to gangs in the area. Futuro FM — The Zaibatsu gang's station. It can be received in all three areas. The DJ, Dean Franz, plays dance, jazz-oriented pop and Funk. Funami FM — The Yakuza gang's station in the Downtown Area. The music is drum and bass-type electronic music. The station is hosted by a Japanese man and a frantically screaming Japanese woman (in a varied high-pitch voice) calling herself Teriyaki-chan. Lithium FM — The Loonies' station. Features a totally insane DJ, Spaz Funbags, as well as some oldies and dance-music. Rebel Radio/KING — The Redneck gang station in the Residential Area. The DJ, Marshall Nash, has a thick Southern accent. The music of choice is modern and classic rock. Osmosis Radio — The Scientists' station, transmitting in the Residential Area. The DJ "Mama Doc", who is Icelandic or Scandinavian, plays modern dance music. Heavenly Radio — The Krishnas' gang station, transmitting in the Industrial Sector. The music is a mix of Jesus-pop and soft music. Listeners are continuously urged by the station's DJ, Venus Ordelia, to convert. KGBH — Radio station of the Russian Mafia with DJ Bombatumba. KGBH frequently encounters both technical and personal problems that interfere with their broadcasts. The station primarily plays classic rock. GTA2 was the last PC GTA with built-in multiplayer with the exception of GTA IV. It supported up to 6 players and connections via internet, LAN, serial cable or direct modem connection. There are also 3 small multiplayer maps designed for smaller number of players, as well as 3 districts with modified locations of weapons and parked cars. Playing via internet using only built-in tools is quite difficult. First you need to choose "tcp/ip connection", then enter server IP and you will be able to join only if host is in hosting menu. That's why programs like GTA2 Game Hunter, or GTA2 Gamer were made. They provide one-click joining without entering anybody's IP, chat and some other useful options which makes playing GTA 2 online as easy as any other modern game. The live-action rendition of Claude Speed, played by Scott Maslen, from the opening cinematic of Grand Theft Auto 2. The opening of the game was pieced together from live film-material that was taken from an 8 minute GTA 2 short-movie created for the purpose of advertising the game. This movie has since been made available to the public and is downloadable from the game's web-site. Whether the movie can be considered canonical is debatable, as it shows Claude getting killed at the end (shot by a Zaibatsu hitman while trying to break into a sports car). Despite the fact that GTA 2 is supposed to be set in the near future, the movie was clearly shot in present-day New York City, and also featured a blue-and-white NYPD Chevrolet Caprice police car as a pursuit vehicle. Claude Speed was played by Scott Maslen. This Game can be downloaded & played on the PSP. All of the respray garages have a "Max Paynt" sign on the roof. This is clearly a reference to the then-upcoming video game Max Payne, also developed by Rockstar Games.